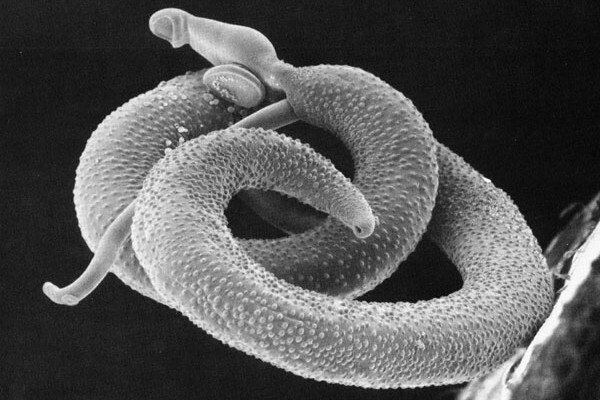 Chris - Schistosomiasis is also known as bilharzia and it is a disease that's caused by worms, and they grow for part of their lives in a species of aquatic snail, and they then infect humans that are exposed to water where those snails live. More than 200 million people are infected and in the majority of cases, people carry the worms for many years and this leads to damage to organs inside the person including damage to their bladder and also to their liver. Adult humans eventually develop immunity to the infection but for some reason, children don't. Now, scientists have discovered why and this could help us to develop a new vaccine. Kate Mitchell who carried out this work while she was a PhD student at Edinburgh University is the scientist behind the breakthrough. Hello, Kate. Chris - So, how did you actually do this? Kate - We took a fresh look at several decades worth of data that's being collected by many people and looking at infection levels and antibody levels in different populations. And then we used new computer models that we've developed to investigate a number of different ideas that people have about how protective immunity develops to schistosomiasis. And so, we took a number of these different theories and ideas, and used these to construct different models and we had almost 3,000 models in total that we looked at quite systematically and then we ran millions of computer simulations to see whether the models could produce the patterns that we see in the field data. Chris - What were the hypotheses that you started with? What sorts of questions or possibilities were you playing with or modelling when you started? Kate - So, one of the main ones we're interested in was, there's a theory that it's only when the adult worms die that they release the right proteins that could stimulate an immune response. The worms live for several years inside humans so that could be delaying the exposure. So we looked at that as one of our hypotheses but we also wanted to check, well what happens if actually, those proteins are coming from other stages of their life cycle so the infectious stage, when you're initially infected or the eggs that worms lay. And we also weren't sure what the effect of the protective immune response is - is it preventing people from becoming re-infected? Is it killing the worms directly? Or is it stopping them laying the eggs? It's the eggs that cause a lot of the damage that we see. So we looked at all those different combinations. There are also different ideas about the precise nature of the immune response, how long the worms live for, that kind of thing. Chris - Where did you get the data to then test these theories against? Kate - So we had several large field tests that as our group at the University of Edinburgh has conducted in Zimbabwe over the last 20 years or so. Data from different populations where we had measured infection levels and antibodies in children and adults in these communities. We also used published data from Zimbabwe and other African countries going back as far as the 1960s. Chris - So, you had all these hypotheses, you had built clever models that enable you to test all the possibilities so you'll know what the outcome should be if that possibility is right. You then compare that with the data and see if it fits the pattern you would expect if that hypothesis is true. What emerged as the thing that you think is the reason why the adults get the immunity eventually and then spit out the worms? Not really obviously, they suppress the worms. I don't want to give anyone nightmares, but children don't. What's going on? Kate - So, we actually got a very clear answer and it related to some of these theories that I outlined earlier. The protective response, the one that's actually protecting against disease is triggered by proteins that are released when the adult worms die. And this is stimulating antibody responses. And what those antibodies are actually doing is preventing the remaining worms from laying any further eggs. And the reason why this is usually only seen in adults is just because it takes a long time to actually get enough exposure for enough worms to die and trigger enough response for it to be effective. Chris - Because the worms themselves can suppress the immune system, they sort of evade the immune system so that the immune system can't see them. They're mostly invisible, cloaked to the immune system when they're alive and it's only when they die, that that cloaking device (for want of a better phrase) breaks down and the immune system can see the worm and make a response to it. That response is then effective at stopping other worms that are alive, making any eggs. Kate - Partly. So, that was one hypothesis that we tested. Are the worms just suppressing this protective response? And actually, that wasn't really giving us results that were consistent with the data. So they certainly are suppressing some responses. I mean, there are all sorts of immune responses going on. There are a lot of inflammatory responses to the eggs, so we suspect the suppression is of an early response that would damage the worms. But the response that we're detecting here with these models is a protective response. It's a different response that is just taking an awful lot of time to build enough exposure. Chris - If it takes a long time, what is the prospect then of being able to make some kind of vaccine that will make a child make that response? So that if they are exposed to the snails in the water, and the worm is trying to infect them, it wouldn't be able to? Kate - It's probably part of a question of quantity and identifying the correct proteins that you need to put into your vaccine to create the right response. Chris - But this would suggest that it is possible. So, if we can simulate what happens to an adult given enough time in a child, we would be able to protect the child potentially against bilharzia. Kate - Yes, that would be the aim. Chris - Let's hope so. Thank you very much. That's Kate Mitchell. She's now working at London School of Hygiene and Tropical Medicine. She was talking there about the work she did towards her PhD when she was at Edinburgh University. What's the latest in Alzheimer's research?